Antique ring with hair and enamel and secret hinged top. Antique enamel ring with hinged top. Product code: ES6160 Categories: Sold Items, Sold Jewellery. Antique rings are so often so unique and special and unlike anything found today, and here is an antique ring that is just incredible and truly like no other. 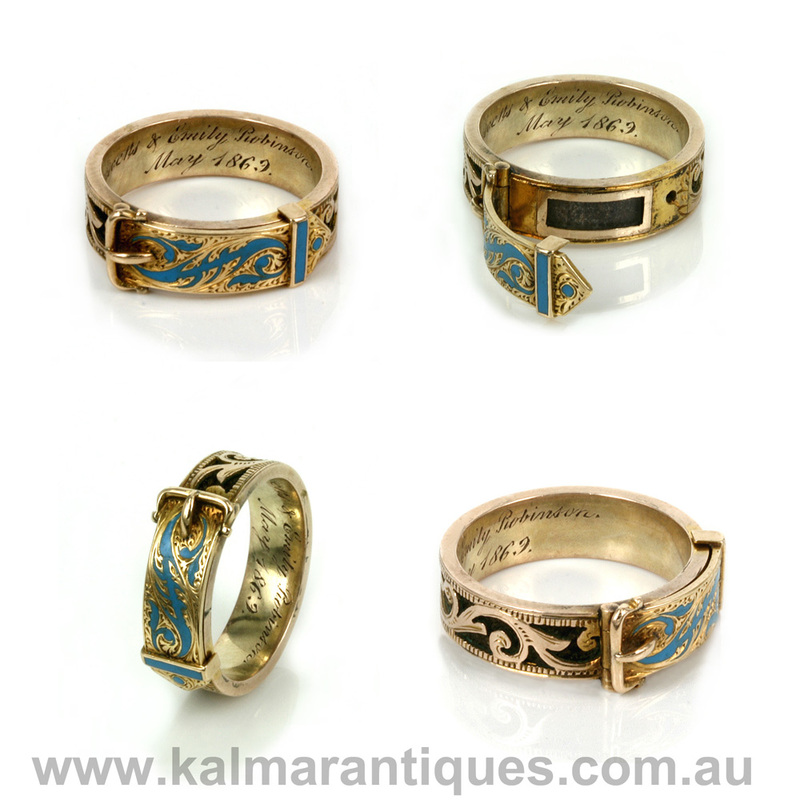 Made in 15ct gold in 1869, this is a ring that has so many special features to it that it is hard to decide which aspect to start. Firstly the ring has that wonderful blue enamel on the top. The light colour of the enamel makes it so charming instead of the darker coloured enamels used. Then the top itself is hinged revealing a locket compartment set under. This is such a wonderful design feature that makes this ring even more special than just a standard enamel ring. And incredibly the design all around the band gets even more special when you look close. Under the gold design, the ring is enveloped with hair that has been plaited around. The Victorians loved using hair in jewellery and was so sought after at one stage even surpassed silver in price per gram. Inside the band is hand engraved with “Crescens & Emily Robinson May 1869” and the ring itself measures 5.3mm wide and is a size K and due to the hair can’t be re-sized. This antique ring is so incredible and truly like no other.